You can read their citations below. If you wish to nominate someone for a Golden Clematis Award, please click on Golden Clematis Award Nomination Form. Nominated by Richard Huff, USA, seconded by Mahala Huff, USA. "Linda Beutler has done well in educating the world around her about clematis. Her ambitions include writing a book on clematis and directing the focus of gardeners in North Western United States on the Clematis Collection of Brewster Rogerson. She is currently giving her time and talent to acting as President of the International Clematis Society. She is greatly motivated in gardening affairs." The photo shows Linda Beutler receiving her Golden Clematis Award from the new President, Jeff Jabco. Nominated by Ken Woolfenden, Great Britain, seconded by Deborah Hardwick, USA. 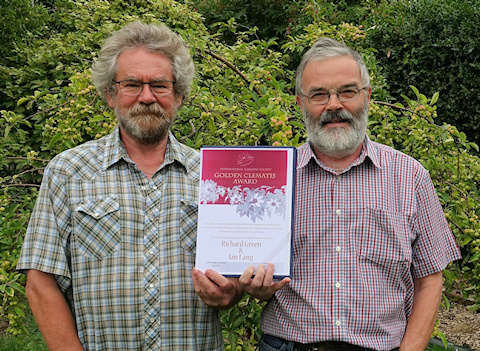 "I wish to nominate Ian Lang and Richard Green for Golden Clematis Award(s) for their work, creating and maintaining the Clematis on the Web website. Clematis on the Web was started around 1999 (I believe) and rapidly became is a primary source of online information on over 3500 clematis cultivars, species and hybrids alike, with more than 3900 photos of nearly 50% of the cultivars featured. Putting this much information together in a single place is a mammoth task, maintaining it and continually expanding it is a major undertaking and commitment. Not only is this resource available online and free (although Ian and Richard are the first to acknowledge the help of the University of Hull in providing a computing platform to host the website), Ian and Richard and built superb searching facilities to make it very easy for anyone to use. They have approached the design and implementation from the point of view of the user, ensuring a very user friendly interface, easy to use and guaranteed to enable you to finds the answer to whatever question you pose. Search facilities include alphabetic, contextual text search (including partial text searching), picture searching and many more. In addition, they have added sections on clematis people, diseases, pruning and registration. With the International Clematis Register and Checklist only available as a book, as are the current four separate supplements, whilst it is a very comprehensive resource it is not the easiest to access. Ian and Richard have created an easy to use resource to complement the Register, available wherever you can access the internet. It is high time the clematis world recognizes their achievement." 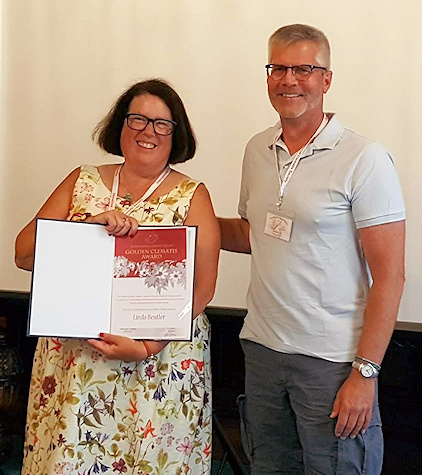 Editor's note: At the time I wrote this nomination there were only four supplements published for the International Clematis Register and Checklist. As this award is ratified, in July 2018, there are currently six. They are all available in electronic format from the RHS website, please see our homepage. "Everett is an excellent ambassador for the International Clematis Society. When Mahala and I attended our first I.Cl.S. Conference in Portland, Oregon in 2002, Everett immediately became acquainted with us and followed up with supplying us with many Clematis slides and other materials that we could use in our presentations for Master Gardeners, garden clubs and people wanting to know about the wonderful clematis vine. Everett is a known liaison with the British Clematis Society. Clematis is a passion for him. He is a positive person in promoting clematis for others." 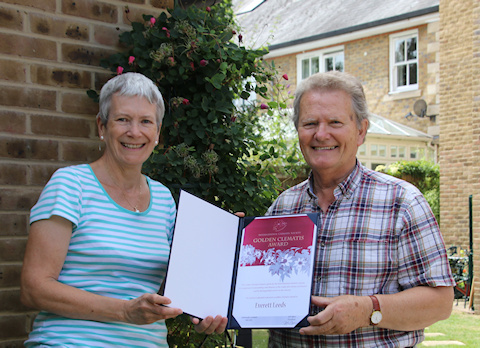 The photo shows Everett Leeds receiving his Golden Clematis Award from our Secretary, Fiona Woolfenden.